Innocent Manthanites, who were once incognizant of their untapped potential, have now cultivated enthusiasm to bring it out. Apparently, a plethora of extra-curricular activities are organized at different Sampoorn Vikas Kendras to enhance their creativity. 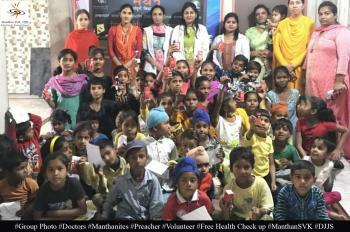 The recent event was a Talent Search Competition organized at Gopal Nagar SVK in Ludhiana, Punjab wherein Manthanites gave an exuberant participation. 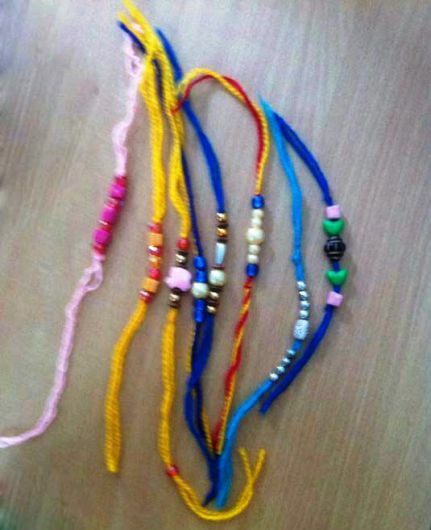 Demonstrating their hidden abilities through Creative Arts, they made beautiful Rakhis using waste material. This effort earned them appreciation and rewards. 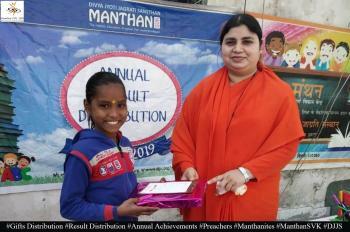 Sadhvi Rajni Bharti, Preacher, Divya Jyoti Jagrati Sansthan (DJJS), who was also present on the occasion, expressed, "Milk is churned to make butter. Similarly, this churning process is applied at the SVKs to discover the hidden talent of students". Altogether, this competition boosted the morale of students who were encouraged to give their whole-hearted participation in every activity as well as become instrumental in social welfare.